The Endoscopy Center strives to provide the highest quality care available in Northeast Louisiana. Our staff consists of well trained nurses and technicians that have many years of experience with procedures and treatments in gastroenterology. We are dedicated to continuing our staff’s knowledge of the latest technological advances, in which they attend continuing education courses and are members of the Society of Gastroenterology Nurses Association. We also have nurses that furthered their expertise and received their certification as a (CGN) Certified Gastroenterology Nurse. Our staff is devoted to make certain that medical procedures are performed according to specific guidelines and that patients are well monitored and cared for during their stay. From our receptionist to the nurses, we want to assure that your time with us is a comfortable and pleasant experience. With this in mind, a staff member will contact you following your procedure to assess your recovery and determine if your expectations were met. 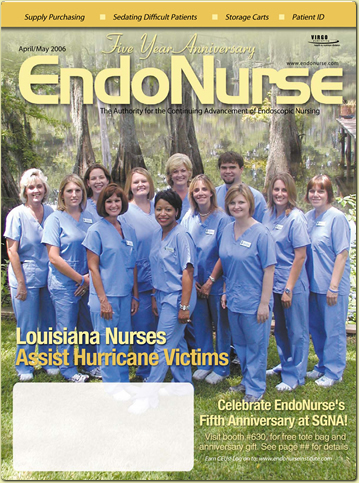 Nurses from the Endoscopy Center were Recognized Nationally for their outstanding efforts in assisting huricane Katrina victims.